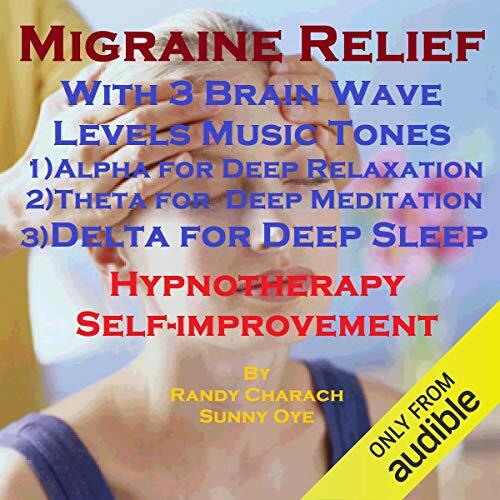 Migraine Relief -with Three Brainwave Music Recordings -Alpha, Theta, Delta -for Three Different Sessions. Hypnosis is a viable alternative to pain medication, even for those who have suffered from migraine headaches for years. Migraines are triggered by certain events and are classified as a type of headache that usually starts on one side of the head or the other and lasts for between 4 and 72 hours. Hypnosis is effective in treating migraine headaches because it can focus on the triggers that lead to the headaches. When the veins and arteries around the brain get inflamed, the symptom is often a migraine headache. Inflammation can occur from the consumption of alcohol or caffeine, but it is most often set off from tension, fatigue and emotional stress or trauma – these areas are effectively managed through hypnosis. 1) One recording for Alpha (7-13Hz) – The Deep Relaxation and Light Meditation Wave. Alpha brain waves are present in deep relaxation; usually when the eyes are closed, when slipping into a daydream or during light meditation. It is an optimal time to program the mind for success and it also heightens your imagination, visualization, memory, learning and concentration. 2) One recording for Theta (4-7Hz) – The Deep Meditation and Light Sleep Wave. Theta brain waves are present during deep meditation and light sleep. It is the realm of your sub-consciousness and experienced as you drift off to sleep from Alpha or wake from deep sleep (from Delta). It is the brain wave where our minds can connect to the Divine and manifest changes in the material world. Your mind’s most deep-seated programs are at Theta and it is where you experience vivid visualizations, great inspiration, profound creativity and exceptional insight. 3) One recording for Delta (0.5-4Hz) – The Deep Sleep Wave. The Delta frequency is experienced in deep sleep, transcendental meditation where awareness is fully detached. Delta is the realm of your unconscious mind, and the gateway to the universal mind and the collective unconscious, where information received is otherwise unavailable at the conscious level. Among many things, deep sleep is important for the healing process – as it’s linked with deep healing and regeneration. Randy Charach is a US based Canadian Celebrity Hypnotherapist, Public Speaker, with over 25 years of experience. His clients include John Travolta, Tony Curtis, Sean Penn, as well as hundreds of others. As a public speaker, he had addressed audiences at companies like Microsoft, Coca Cola, Disney, IBM and Xerox and many other satisfied clients all over the world. Simply the best! I've listened while I had a migraine. helped me sleep but still have migraine. I can't really say whether it reduced the severity or not, it's possible as I've made it through 3 migraine days without meds. it was definitely good for relaxing and helping me sleep though which is sometimes hard when your head is pounding. Yes. I find chapter 3 the most useful and will always just replay this so personally I would recommend just playing chapter 3 most of the time. I suffer from migraines hence I bought this. I have tried alot of different self hypnosis audios for various things which sound nice but dont really create any real change. I noticed not only can I fall asleep to chapter three but I notice changes in healthy food and lifestyle choices and support for other ailments the next day. When I listen to the audio consciously without sleeping I realised it is because there is suggestions to the body - all the organs and blood etc that they will work optimally. The more I use it the better I feel and the less likely my migraines come back. Anytime I do get them back or when I am having pain or other issues in the body I will use this audio for several days and nights and I find it really helps. Healing by experiencing your birth?! What disappointed you about Migraine Relief with Three Brainwave Music Recordings? I understand that many of us have a lot of issues that contribute to our illnesses, but to not start off with any kind of real explanation as to what is coming and go right into a hypnosis that you are supposed to do regularly that takes you back to when you were born as part of the path to your healing, I frankly found ridiculous and insulting. I didn't even finish the first session because the author lost all credibility with me. In the 1st exercise you are told to forgive your birth mother and birth father and everyone there at the time of your birth as if everything wrong with yourself was caused at birth! Helps drastically lower pain via guided meditation, more relief than medications! Able to function again!